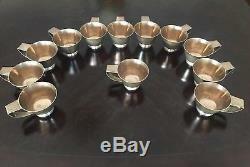 For sale are 12 sterling silver cups by master silversmith Allan Adler. Each cup weighing a heavy 150 grams, 1800 grams total. Each cup measuring approximately 2 tall and 5 long overall. All cups need to be polished, otherwise in great condition. The item "(12) Allan Adler Sterling Silver Modern Cups" is in sale since Friday, July 6, 2018. This item is in the category "Antiques\Silver\Sterling Silver (. The seller is "los_angeles_antiques_1" and is located in Montebello, California. This item can be shipped to United States.